Item is a coloured copy of the full score for part 5 of Nasca Lines in graphic notation. 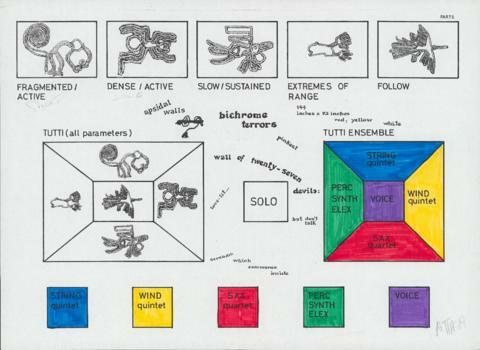 The score includes representations of the flashcards used by the conductor for this part of the score, including colour flashcards that indicate instrument groups (yellow for the wind quintet) and flashcards that indicate improvisational styles via graphic representations of geoglyphs from the Nazca Desert, Peru. The score also features phrases from Alan Davies' texts. The score was annotated by the trumpet player, Richard Simoneau, for the premiere performance.